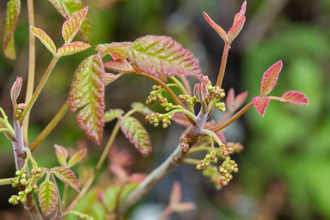 Sugar Bush - Rhus ovata, is an evergreen plant that grows as a shrub or small tree and thrives on south facing slopes below 1300 meters. It is native to Southern California, Arizona, and Baja California. Sugar Bush varies in size from two to more than eight meters in height. As a tree, it has a rounded appearance. As a shrub, spreading in width rather than height it looks kind of like a thicket. The twigs are thick and reddish in color. The leaves are dark green on the top, dull on the bottom, leathery, and folded in the middle. The leaf pattern is alternate (one on this side and then one on that side). Typically, the leaves have no serrations but occasionally they do have some serrations. Flower clusters at the ends of branches are small (two to three inches long. They are five-petaled, flowers that appear to be pink, but instead have white to pink petals with red sepals. The fruit is a small reddish, sticky fleshy fruit surrounding a pit (like a peach or cherry) that botanists call a Drupe. Between March and May, numerous flowers appear in dense clusters on short stalks, from pinkish-red buds formed during the preceding summer. The tiny flowers have five red sepals and five white or pinkish petals and are about 1/4 inch across. You need a magnifying glass to see the flowers five stamens and three pistils. Some of the flowers have only pistils, but no stamens. As time progresses, the flowers become rose-red berries that are about 3/8 inch in diameter and covered with a thick layer of sticky hairs. The fruit is round but flat with only a tiny amount of pulp. 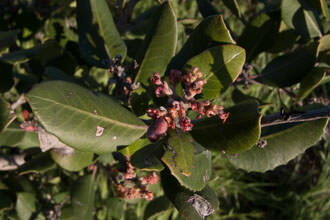 Sugar Bush is similar enough in appearance to Lemonade Berry - Rhus integrifolia to confuse most non-botanists. They occupy different environmental niches. Lemonade Berry grows closer to the coast usually on the northern slopes and has smaller leaves that lie flat. Confusingly for those trying to identify plants, these plants occasionally hybridize. 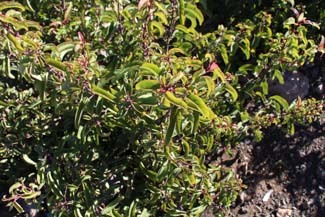 Sugar Bush has also been confused with Laurel Sumac. Laurel Sumac leaves are longer, but you can easily tell which is which by removing a leaf and crushing it between your fingers. Laurel Sumac produces an odor and is easier to tear than the more leathery Sugar Bush. Visually, Laurel Sumac leaves are longer than they are wide and have red veins. After fires, Sugar Bush can re-sprout from its unburned root crown, or it can also grow from seeds in the soil, which are only stimulated to germinate by heat from the fire. This adaptation increases the likelihood of Sugar Bush surviving fires and ensures that there is a major seed bank. Name Origin: Rhus is the Greek word for one Sumac species; ovata is from the Latin word for “egg”, referring to the oval shape of the leaves. Last modified: March 31 2017 21:26:29.